Chris Coleman says he has been left in no doubt that he made the right choice in coming to manage Sunderland, even as the team continues to struggle near the foot of the Championship. The Black Cats take on Bolton Wanderers tonight having won just one of their eight games in 2018. After some encouraging signs early in Coleman’s tenure, Sunderland have regressed badly but the Welshman is as determined as ever to halt the decline. He said: “You go to other clubs and it is like turning a speedboat around, this is like an oil tanker and you’ve got to stop it first. “I keep saying, we’re in the hard yards and it is tough, I can’t deny that I find it hard. I was right to come here, though. 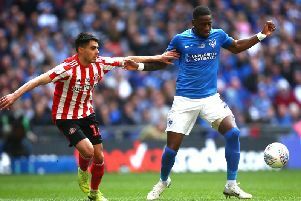 Coleman has faced criticism for some of his selection decisions, most recently when dropping Bryan Oviedo from the squad for the 2-0 defeat to Brentford. The Sunderland boss admits he has had to scrutinise his decisions amid the team’s poor form but again insisted that it will the mentality of his players that determines whether the club are able to avoid a second relegation in as many seasons. He said: “I always do that – I always look at myself. “Maybe I should have changed that earlier, maybe I shouldn’t have gone with that formation, maybe I shouldn’t have gone with that team. “I think you have to do that, even if you win you wonder if you might have done this or that a bit better. “You have to be self-critical, otherwise you start looking round and thinking it’s everyone else’s fault and you don’t progress. “Last week at Bristol City we changed the formation at half-time and there was a big response. “So I thought maybe we should go with a different formation, and we went with a different formation on Saturday and it made no difference. “As I keep saying, it’s state of mind – mentality. Coleman was left despondent following that most recent defeat and admitted that his team’s lack of fight had been keeping him awake at night. With the crucial game against Phil Parkinson’s side on the horizon, however, the Sunderland boss says he simply has to remain positive and look to lift his players for the challenge ahead. He said: “We’ve all given the hair dryer treatment but you don’t always get your point across. “I’ve played every formation under the sun as a manager, no one can put one to me that I haven’t used at some point. “Any successful team I’ve managed has been down to their state of mind and their mentality. If you’ve got too many who like to stay in the comfort zone then you’re in trouble. So the proof will be in the pudding at the end of the season. “Will we have escaped it because we did this, this and this, or if not, why not? It’ll be because too many ducked it or couldn’t cope with it. It isn’t about talent, we’ve got enough of that, we do. “I’ve got to stay positive and try to lead by example,” he added. “We can sit here for hours and talk about all the things that aren’t good, but I’ve got to say, hold on, we’re still only three points off and there’s a lot of games to play. “My only problem is the 90 minutes, that’s the first step forward for us. We haven’t done it over 90 for four games, and so that is the first step forward for us.